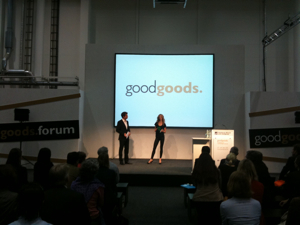 In Mai 2011, the “goodgoods“, Germany’s first trade fair for a sustainable lifestyle celebrated its premiere. Over the course of three days, the fair presented ecologically and responsibly produced, yet highly desirable and high quality goods and services. With over 8,000 square meters of exhibition space, sustainable innovations from all over the world where on display, most of them products and services that use less energy and resources, protect the environment and are manufactured under fair conditions. As the main moderator, I had the pleasure of presenting international speakers, inventors, activists, product innovations and the latest in organic and fair-trade fashion.